These days, I'm stitching with Sashiko cotton thread. 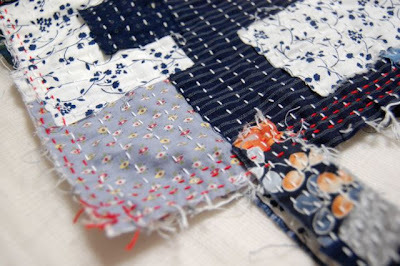 I put my favorite fabrics freely, and sew them together with Sashiko thread. The works comes very rough taste. I like them very much. So, to capitalize this taste, I made this bag. It seems not so strong, but it's really strong enough, because of the thick thread. Japanese people use this thread for strengthen clothes, especially costumes for sports, like Kendo or Judo. I want to make something new with this technique. Oh, I love this Japanese girl's bag very much. 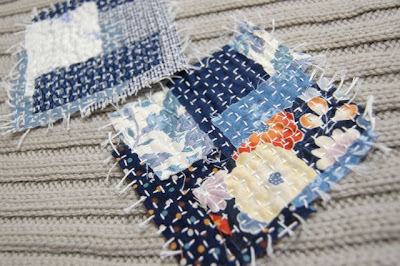 She uses Sashiko thread and linen fabrics. The bags are really cute! Sometimes we name "rough taste" "primitive" in US. there are people who only collect such work. Whenever I think of something made that has unfinished edges or no hems as "primitive"
I like that look also. 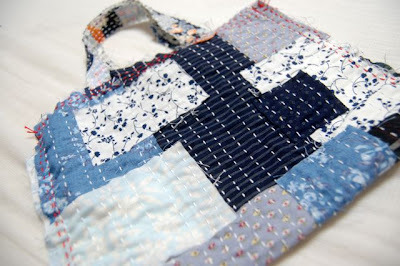 Sashiko is not really "primitive", but your little bag you made could be called "primitive". Thank you Eydie! I didn't know how to express! Sashiko is not primitive work. I like traditional one too. Thank you! How gorgeous it becomes!!! 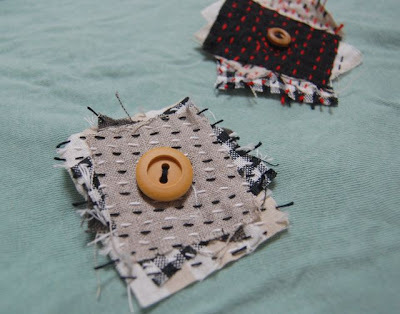 I really appreciate the beauty of this type of sewing. It has an incredible appeal for some reason! I hope you will do more of this! Thank you so much! I myself like it very much. I'll make some new ones! Thank you! This is a Beautiful bag, such as the one from the japanese link. I love this cotton thread very much. By now you may discover that I LOVE bags. Thanks for sharing so much with us. I must try to make at least one. I have many bags, which I bought.